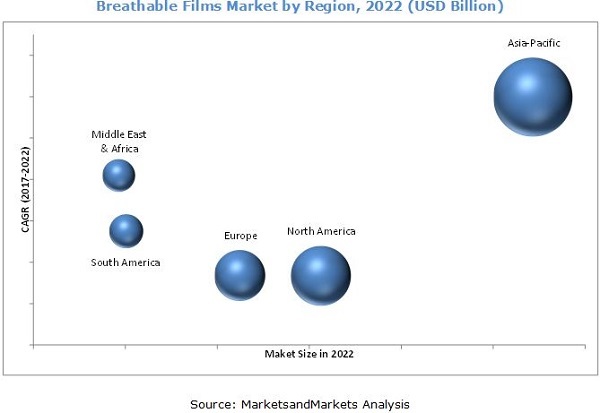 [143 Pages Report] The breathable films market size was valued at USD 1.71 Billion in 2016 and is projected to reach USD 2.55 Billion by 2022, at a CAGR of 7.1% during the forecast period. The base year considered for the study is 2016, while the forecast period is from 2017 to 2022. Both top-down and bottom-up approaches have been used to estimate and validate the size of the breathable films market and to estimate the sizes of various other dependent submarkets in the overall breathable films market. The research study involved extensive use of secondary sources, directories, and databases such as Hoovers, Bloomberg, Chemical Weekly, Factiva, and other government and private websites to identify and collect information useful for a technical, market-oriented, and commercial study of the breathable films market. The supply chain of the breathable films market starts with the sourcing of raw materials, followed by manufacture of breathable films, supply of breathable films to product manufacturers, and supply of finished breathable films products. The major players in the breathable films market are RKW Group (Germany), Arkema (France), Clopay Plastic Products (US), Mitsui Hygiene Materials (Thailand), and Fatra (Czech Republic). Other leading companies in this market include Toray Industries (Japan), Covestro (Germany), Nitto Denko (Japan), Trioplast Industries (Sweden), SWM INTL (US), Rahil Foam (India), Skymark Packaging (UK), Daika Kogyo (Japan), American Polyfilm (US), and Innovia Films (UK). This research report categorizes the breathable films market on the basis of type, application, and region. The breathable films market size is estimated to be USD 1.81 Billion in 2017 and projected to reach USD 2.55 Billion by 2022, registering a CAGR of 7.1% between 2017 and 2022. Rising awareness regarding health and hygiene and increasing purchasing power of consumer are the major drivers of the global breathable films market during the forecast period. Breathable films are classified into four types based on the raw materials used during its manufacturing process. The types are polyethylene-based breathable films, polypropylene-based breathable films, polyurethane-based breathable films, and others. The others type segment includes polyether block amide-based breathable films, co-polyamide-based breathable films, and polyether ester-based breathable films. Polyethylene-based breathable films are the most-widely used type of breathable films as these are low in cost as compared to any other type of breathable films and have favorable properties such as high absorbency, permeability, and strength. By application, the breathable films market is classified into six segments, namely, hygiene, medical, food packaging, construction, fabric, and others. Hygiene is the largest application segment of breathable films. Growing penetration rate of baby diapers and sanitary napkins in the developing countries are expected to drive the breathable films market in this application segment. The medical application segment is expected to be the fastest-growing application segment during the forecast period. Increased use of breathable films in surgical drapes and gowns is expected to be the major driver for this segment. Asia Pacific is estimated to be the largest market for breathable films and is also projected to register the highest CAGR during the forecast period. China is expected to account for the largest share of the market in Asia Pacific till 2022. Major producers of breathable films such as Mitsui Hygiene Materials (Thailand) and Nitto Denko (Japan) are located in the Asia Pacific region. North America accounts for the second-largest share of the global breathable films market. Companies are using investment and expansion strategies to increase their market share and cater to the increasing demand for breathable films. For example, in July 2016, the company invested into a line of good quality film prints for packaging solutions in Vietnam, Malaysia, Laos, Indonesia, and Myanmar. Through this, the company aims to meet the rising quality standards for different products. 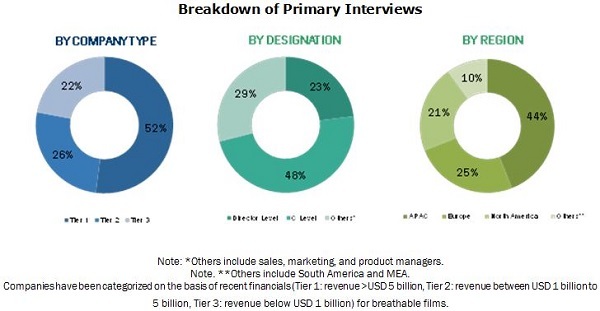 Companies such as RKW Group (Germany), Arkema (France), Clopay Plastic Products (US), Mitsui Hygiene Materials (Thailand), and Fatra (Czech Republic) adopted investment, expansion, new product development, and agreement strategies to expand their market share and product portfolio in the breathable films market from 2014 to 2017. 10.11.2 Rahil Foam Pvt. Ltd.